[0:19] <StarkDeadmause> know the trick? [0:33] <StarkDeadmause> what are you guys working on? anyone made a pentest drop box? [1:53] <JessicaRN> Hey folks, how can I use git offline? [1:56] <methuzla> you are trying to clone a git repo from the net, without net connection? [1:57] <JessicaRN> I use a Hotspot off my phone for access to the net. [2:01] <JessicaRN> Does that make sense? [2:01] <methuzla> not really. what currently has access to the net? pi or laptop? [2:02] <methuzla> and the driver is in a git repo? [2:03] <methuzla> would cloning it to the laptop then pushing it to the pi work? [2:04] <JessicaRN> This is what I'm trying to do. [2:17] <methuzla> or, can you get the pi on the net via the wired port? [2:18] <JessicaRN> Is there a ftp server in the base build of raspbian? [2:19] <methuzla> dunno. been using scp. [2:20] <methuzla> so the pi is totally off the net? no way to get it on? [2:22] <JessicaRN> Ok. So ftp it? [2:30] <JessicaRN> Err, how do I mount that thumbdrive? [2:37] <methuzla> did it create a directory called rtl8812au ? [2:39] <JessicaRN> Should it be located some where special? [2:47] <methuzla> bummer. not sure how to pull down the other dependencies without a network connection. [2:51] <StarkDeadmause> what are you guys trying to pull out? [2:54] <Tenkawa> JessicaRN: whats wrong... i missed the beginning? [2:55] <StarkDeadmause> you gut untar installed? [2:56] <Tenkawa> whats the issue? [2:57] <JessicaRN> That is what my make is failing on. [2:57] <StarkDeadmause> pardon my stupid question, did you cd into the directory containing the makefile? [2:58] <ctrlshftn> JessicaRN: do you have any previous experience with linux? [2:58] <Tenkawa> did you run a make modules_install from your kernel source or install the package? [2:59] <StarkDeadmause> jajajaja any experience with ls -a? [3:00] <ctrlshftn> JessicaRN: I suggest you read up about the commands. try it on some websites to get the hang of it. [3:01] <JessicaRN> Tenkawa: I don't have net access on the pi yet. [3:01] <Tenkawa> you running raspbian? [3:01] <Tenkawa> or which distrib? [3:03] <StarkDeadmause> you have the pi connected using ethernet cable? [3:04] <JessicaRN> Are they not part of the distro? [3:05] <Tenkawa> good luck.. i have to run..
[3:06] <StarkDeadmause> why not both at the same time? do you have the pi getting network directly to the laptop? or are you using a modem/router as a medium? [3:11] <JessicaRN> Is that clear? [3:23] <StarkDeadmause> i work in a restaurant and im doing the balance, thats why im in a hurry. [5:08] <tiblock> Hi. I have question. I use raspbian and i want to make SD card live longer. I moved /var/log to tmpfs, but i'm not sure about /tmp, is it located on sdcard too or it is in ram already? [5:11] <exonormal> it's on the SD card, everything is..
[5:35] <tiblock> exonormal, its 8gb and i have dock station connected with 2TB HDD. Is it good idea to move /tmp to tmpfs with like 10mb size or better HDD? [5:38] <tiblock> exonormal, okay, will move to tmpfs, thank you. [6:21] <fred1807> how do I hide the terminal? [6:32] <[Saint]> fred1807: in this instance, you don't. [6:52] <fred1807> ok so getty is the process waiting for me to enter password? [6:54] <[Saint]> getty handles TTY logins, so, yes, possibly - depending on the context. [6:57] <[Saint]> If you did so you would remove your ability to log in. [6:57] <[Saint]> see above "getty handles TTY logins". [6:58] <[Saint]> Maybe you could say what it is you're trying to achieve? [7:01] <[Saint]> That is irrelevant. [7:02] <[Saint]> I'm not sure how to make this any clearer. If getty wasn't running, you wouldn't be /able/ to login via ssh. [7:03] <[Saint]> well...technically you could, but you would need to replace it with fgetty or ngetty, which is essentially the exact same thing. [7:03] <[Saint]> you need it to exist so that it can detect the connection attempt and process the login. [7:05] <[Saint]> perhaps I need to be more specific. when I say it handles TTY logins, you should note this this /includes/ ssh. [7:06] <[Saint]> TL;DR: Loggin in via a textual session? Bam - getty. [7:06] <[Saint]> No getty (or equivalent), no login. [7:12] <viscera> So I've ordered some ModMyPi cases for RPi2 which apparently support VESA mounting (100mm x 100mm) but I can't seem to find where to buy such a product. Can anyone help me out? [7:12] <[Saint]> such a product as...? [7:13] <[Saint]> You mean you can't find where to buy a FDMI/VESA? [7:14] <[Saint]> FDMI/VESA is a standard mounting interface for LED/LCD flat panel monitors. [7:14] <[Saint]> The idea here is to tag the case onto the back of a flatpanel monitor to get it out of the way. [7:16] <[Saint]> WHat do you mean "the product"? [7:16] <[Saint]> Are you confused about how this works? [7:16] <[Saint]> There is nothing secondary to buy. [7:16] <viscera> [Saint]: i.e. some bit of plastic metal that interfaces between the monitor and the case. Oh, so you're saying the case just does it natively with the supplied screws? [7:17] <[Saint]> Case (w/ FDMI/VESA), monitor (w/ FDMI/VESA), ...bom. Done. [7:17] <[Saint]> Nothing else required. [7:17] <[Saint]> FDMI/VESA is just a standard for a bunch of holes a specific distance apart. [7:19] <[Saint]> There's different standards for FDMI/VESA, so adapter plates exist. But FDMI/VEDA D (100mmx100mm) is entirely standard. [7:20] <[Saint]> there's also VESA B 20mmx50, VESA C 35mm x 75mm, ...so on. [7:23] <[Saint]> But I guess if you need an adapter plate all depends on what your monitors(s) support. [7:25] <[Saint]> Oh, actually...hmmmm. Looking at the mounting holes for the case in question, it doesn't appear to support any of the standard VESA configurations (looking at their stated dimensions). [7:25] <[Saint]> So I guess you might need an adapter. [7:29] <ThinkingofPython> Is it possible to put ChromeOS on a Pi2? [7:39] <[Saint]> Hexxeh nuked all his ChromeOS work. [7:40] <[Saint]> But it was roughly the same story as with Android anyway. [7:40] <[Saint]> Blah blah...something something...GPU...non-accelerated, blah blah...runs like a bag of crap. [7:42] <[Saint]> A sheet of 120mm X 120mm perspex would do just fine. [7:43] <[Saint]> or any suitable stiff material really. drill some 6mm holes at 100mm X 100mm, then line up the pi cases' mounting holes in the middle of it. [7:43] <[Saint]> though you could almost certainly just use one or two of the holes in the pi case already. [7:44] <[Saint]> that's plenty enough to secure it, it'll be on a funny angle, but, no one'll see it. [7:44] <[Saint]> It's really odd that the case doesn't jyst have a set of standard mounting holes for FDMI/VESA on it already though. Mine did. [8:51] <Xark> Berg: Nice. How old is he? [9:02] <Berg> these instructions here call for a usb stick? [9:06] <Berg> am i in the wrong place? [9:07] <Berg> use a sdcard? [9:28] <Berg> djazz: get someone to break in and watch it for you? [9:31] <Berg> some one was saying you can plug in phoine touch screens to a pi? [10:26] <cybr1d> Phew. Finally got znc working on boot. Was having some cron issues, sorry the the join/part spam. I should be done for now. [11:18] <Armand> "we dont see you leave or join"
[11:18] <Armand> I see all join, leave, quit. [11:18] <Armand> "we" = incorrect. [11:21] <Berg> so you have turned conference mode off or something? [11:22] <Armand> Forget about it.. You obviously missed something. [11:22] <Berg> so your point is? [11:22] <Armand> Just forget about it.. Done. [11:41] -mquin- [Global Notice] On or around Friday, October 2nd we will be cleaning up the services database. Now's a good time to ensure you identify to services when connecting. Check out http://blog.freenode.net/2015/09/services-database-purge/ for more. [11:44] <clonak> If I have a 2amp power supply for the rpi 2, is it capable of running a 2.5" ext hard drive? [11:44] <clonak> Or is it better to run it off a usb hub still? [11:45] <skyroveRR> clonak: try it and see..
[11:46] <clonak> When it was first released, just wondering if anyone has actually done it. [11:56] * Xark notes he got his USB HDD working only with *3* Amp power supply (and config.txt tweaks for full USB current). 2A didn't cut it (but this was with a somewhat older 320MB WD USB HDD - new ones may take less power). [13:46] <Axy> any well known online shop such as adafruit? [13:59] <Axy> thank you shauno ! [13:59] <shauno> no idea what other options there are, I'm not in germany, just prefer to shop from anywhere else that uses eur. [14:01] <Armand> Yup... Going to the Euro = VERY bad move. [14:15] <ppq> so you just connect it with a serial terminal? [15:22] <stealthii> anyone have any luck using the composite out on the Raspberry Pi for displaying vector graphics? [15:30] <shiftplusone> stealthii: could you be specific about the problem? [15:34] <shiftplusone> ah, okay because without context 'vector graphics' could mean a number of things. No idea. [16:32] <Axy> How can I run a nodejs app on port 80 on my rpi ? [16:33] <Tenkawa> what user is trying to run it? [16:34] <Axy> Hm. it would not be safe to run port80 app as root right? [16:35] <Tenkawa> whats node.js recommended to run as? [16:38] <Axy> I mean, would it be overkill? [16:47] <fred1807> is there a web browser I can control 100% from command line? [16:49] <fred1807> apt-get links/elinks, lynx ? [16:50] <Tenkawa> shauno: yea... it didnt last long from my memory..
[17:14] <Flipo> Hello, anyone knows if it's possible to display current framerate with omxplayer ? [18:40] <netbilly> I don't know what else to try. rpcbind is running, nfs-common too. [21:11] <ali1234> is pastebinit broken in jessie? [23:01] <jancoow> What would u guys suggest? [23:04] <jancoow> but at least 500m would be needed i think? [23:04] <k_j> how do you see where it is going? [23:05] <k_j> jancoow, have you choosen the quadcopter? [23:06] <pksato> to send live stream? need bandwidth. It is not easy and cheap to do. [23:08] <jancoow> but lets forget the 1 km (was to optimistic), something more in the range of 300 to 500m ? [23:09] <k_j> is a 3g key more power consuming than wifi dongle? [23:17] <jancoow> just normal FM-AM frequentius do u mean? 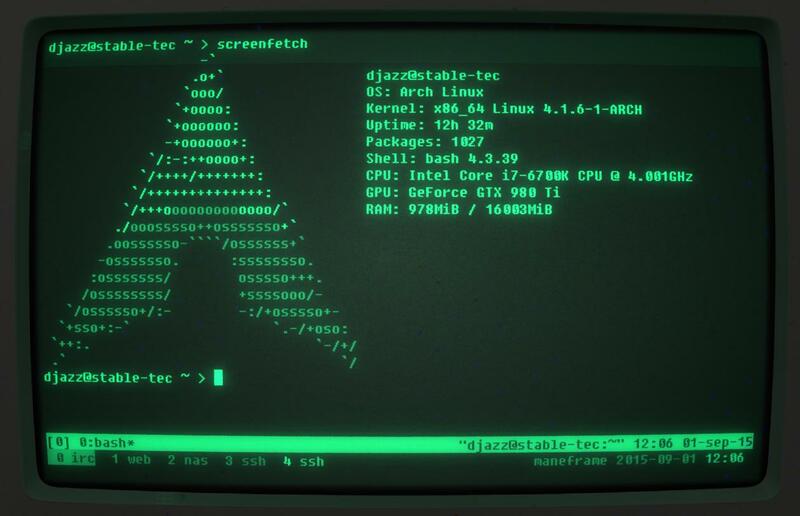 [23:26] <djazz> qt5 compiled today, and cool-retro-term runs gr8! [23:27] <jancoow> Nice, i will read through it tommorow. [23:29] <MegaUZI> My RPI finally works ! Are there patches or anything to make the desktop UI look a bit better ? [23:34] <djazz> you mean the lxde desktop? [23:46] <MegaUZI> for minecraft ? [23:48] <MegaUZI> Can it replace donald trump ? [23:48] <MegaUZI> but raspi with ethernet has a somewhat fine download speed right ? [23:50] <MegaUZI> so pi has no problems ?